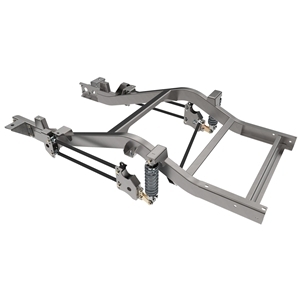 Rear Clip Thru Bed & 4-Link C/O 63-72 C10 Chevy 1/2 Ton Pickup Includes Weld-In Thru Bed Floor Extended Drop Notch Mandrel Bent 2 x 4 Frame with Coil-Overs and Panhard Bar. Options for Watts Link, Spring Rate and Shock Valving. Positions Rear Ride Height 7 to 10 Inches Below Stock.